Who consults doctors online in China? Online medical consultations have barely taken off in the US and Canada. The story is different in China. 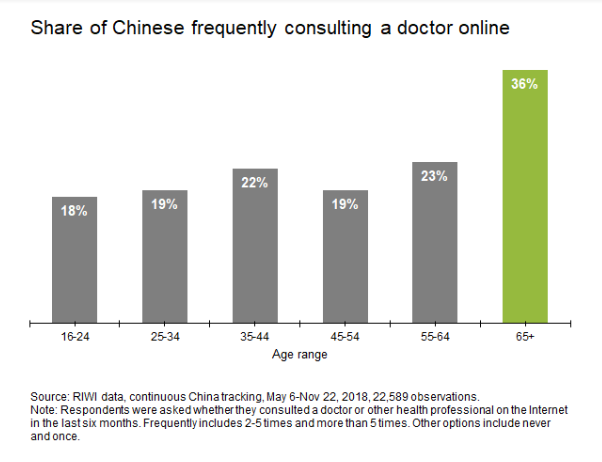 RIWI data on almost 23,000 Chinese Internet users show that nearly two of every five have consulted a doctor or health professional online in the last 6 months. Seniors are the most active: The most active users of online consultations are seniors and those in rural areas, suggesting that the digital health opportunity in China extends far beyond young urbanites. These data suggest there at least 14 million Internet-using seniors who are already comfortable with frequent online health consultations. Broad-based observations: This is the first independent data on such consultations that does not use paid panelists and that goes beyond the main cities to include all regions of China. It points to a much broader-based audience for digital health – and potentially for all online services – than previously understood. See more data from RIWI’s work on digital health here.